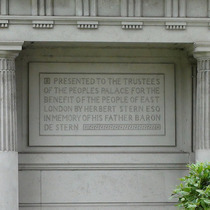 Presented to the trustees of the People's Palace for the benefit of the people of East London by Herbert Stern Esq. 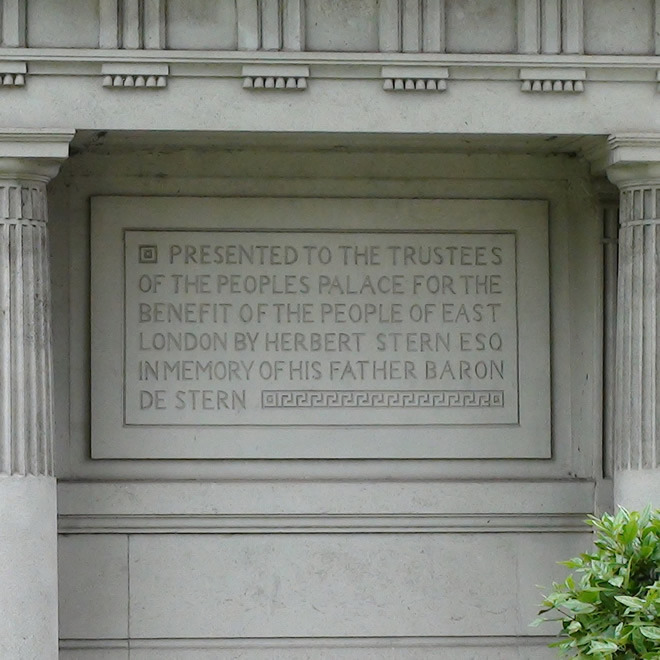 In memory of his father Baron de Stern. Ornamental Passions has a photo of the seagull relief and explains that "Time trieth troth" "was used often to describe the plight of the Jacobites in their weary and fruitless wait for the return of the Stuarts" though that information brings OP no closer to explaining the proverb's presence here. This prompted us to have another go ourselves and discovered that there is a 12-line section of Shakespeare's "As You Like It" that refers to this motto, to birds and to the bay of Portugal (towards the end of Act 4, scene 1) . Given Stern's Portuguese links this seemed relevant but we've examined the text and can see no connection. So the puzzle remains. The north and south sides of this tower each provide a (now non-working) drinking fountain. Edward Robert Robson was the architect for the People's Palace and so presumably this tower is also of his design. This plaque is affixed to the top of the stonework of the well-head.